The mosaic in the peristyle courtyard. In 1881, quite by chance, the remains of a Roman town house were discovered just beyond the Medieval walls of Mdina. 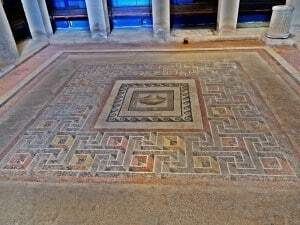 The spectacular polychrome mosaic floors and the artefacts recovered during excavations indicate the domus belonged to a rich aristocrat. At the centre of the house is a peristyle courtyard, with a mosaic floor. 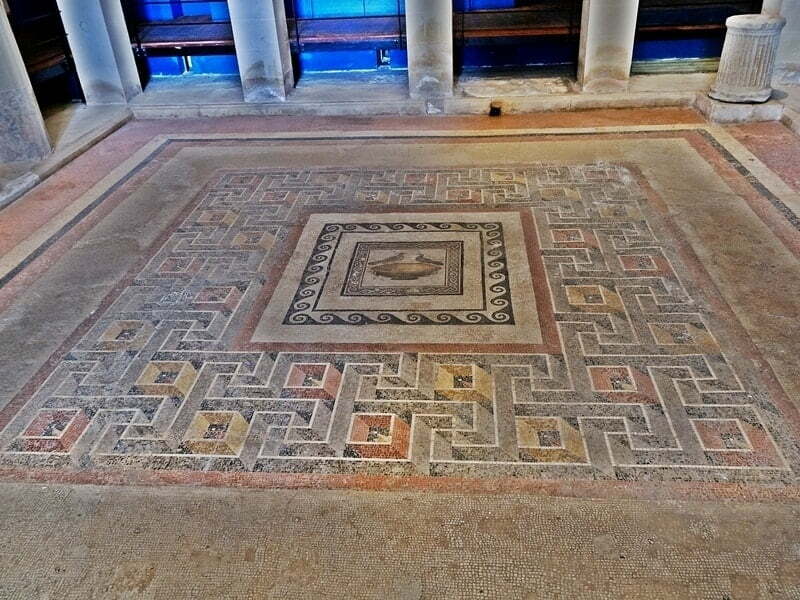 This mosaic and the mosaic floors of two adjacent rooms are well preserved, and have been left on display in situ. The Domvs Romana Museum is the oldest purpose-built archaeological museum in Malta, it opened to the public in 1882 – having been constructed to protect the mosaics. Besides housing the Roman artefacts found in and around Mdina, Roman artefacts found thrughout the island were brought here, resulting in an impressive collection of local and imported objects. Over the years the museum has been substantially remodelled and enlarged, and the displays have been significantly modernised, the most recent being in 2011. Using the remains of the house and artefacts found here, and at other sites in the area, the museum explores the setting of a Roman domestic household. Save money by getting yourself a Rabat & Mdina Multi-Site Ticket. This ticket covers entry to the Domvs Romana Museum as well as two other attractions in Mdina: the National Museum of Natural History and the St Paul’s Catacombs. Not to be missed in the onsite museum is a set of marble statues that portrays Emperor Claudius and his family. This is the only such collection of portraits to have been recovered from a private house anywhere in the Roman empire. Where is the Domus Romana Museum?